The People Behind opens the doors of Raincode’s most valuable employees. That is all of them! Raincode’s team is full of talented, funny and dedicated people. 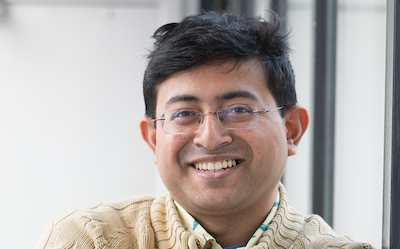 Discover Sudipta Mukherjee, a new member of our team! Hi Sudipta, can you introduce yourself? I come from the Eastern part of India, Kolkata is my hometown. I grew up there and then I migrated to Bangalore. Then I joined Nest Technologies, in Bangalore, which does a lot of application programing. I had always this fascination about programming languages & tools development. I built a lot of tools for myself and for others. After that I joined HP, I was there for about 5 years. I was working for HP Research development, they mainly develop application for smart printers. I used to work for the software part of that & I did also analytics. After that I worked for Epicor. And now I’m here working for Raincode! I was contacted through Twitter by a member of Raincode’s team. What will you be taking care of at Raincode? My mission is to make developers’ life easier. I know developers can never get enough of productivity. I want to take some pain away. Software development is hard so if you get tools that do the heavy lifting, I will be happy. Tell me what brought you to compilers in the first place? I was always fascinated by calculators since I was a child. One day I asked myself: “Can I write a calculator?” I realized it was very messy. When you use a calculator the thing is you don’t know that you are holding variables. Programming languages allows you to declare your variables and take them back. I wrote my first program in C when I was 20 years old, as a graduate student. The second largest program that revolves around the computer are the compilers, the first being the Operating System. This complexity attracted me! Anyways, I did a lot of metaprogramming. I wrote my first parser in 2009, before Roslyn appeared. And Sudipta do you have children? Yes I have one son (he smiles when he says that), he’s three & ½ years old. What kind of joke to you tell your son? I speak Bengali (it’s my mother tongue), Hindi, English & a bit of French. I know you wrote several books. You have a second book coming out, can you tell me a bit more about it? So hackers are people who can put things together right? Do you know the proverb: “Good coders write good code & great programmers steal”? Steal is a bad term. We basically stand on what has been done before us. Roslyn is a fantastic framework and it removed the barriers from metaprogramming. Microsoft couldn’t keep up with the new language features. So that’s the C# story. How can you explain why so many Indians who go into I.T.? We don’t have other options (he laughs)! Joking apart, there’s two main reasons. Computer have become increasingly affordable. And electronics are taught in a very mathematical way in India. Also from a very early age there is a heavy stress on mathematics. For example algebra is introduced in class 7. There is a belief for Indians that if you don’t speak English and are not good in mathematics, then you’re doomed! That is a common belief!